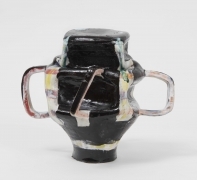 James Cohan will present Thought Presence, an exhibition of new work by Kathy Butterly at the gallery’s Chelsea location from September 6 through October 20. 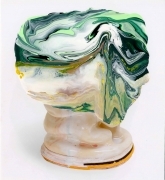 Thought Presence is Butterly’s first solo exhibition at James Cohan. 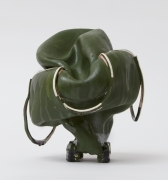 The gallery will host a conversation with the artist and Carrie Moyer on October 13 from 2-4 pm. 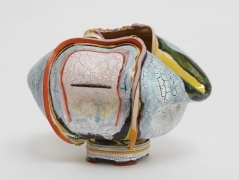 For more than two decades, Kathy Butterly has created striking, evocative sculptures that play between figuration and abstraction, contributing to and expanding the field of contemporary ceramics. 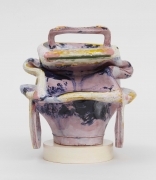 Like George Ohr and Ken Price, who Butterly cites as key influences, she is an artist whose medium is clay and whose considerable ambitions are not tethered to the modest dimensions of her pieces. 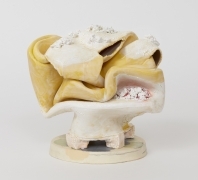 Butterly’s oeuvre is defined by her process: she begins with a cast form, created by pouring wet clay into a plaster mold made from a generic, store-bought vessel, pinching and pulling and folding the clay until she finds something that resonates, Rorschach-like, with her psychological state. 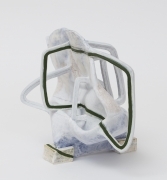 She then refines the piece, carving and smoothing its surfaces in a manner she likens to three-dimensional line drawing. 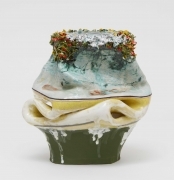 The vessel is subsequently fired and glazed—always repeatedly and often upwards of 30 times—allowing her to paint surfaces and build volumes with accumulated layers of glazes and clay. 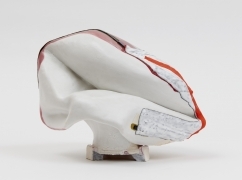 Her work is an exploration of what her materials can do and how she can speak through them. It is also predicated upon risk, for with each firing the chance of loss is always at hand. 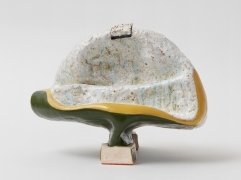 Many of the twenty-four ceramic sculptures in Thought Presence represent a recent evolution in Butterly’s practice toward larger, more abstract works characterized by sparer compositions in a unified palette of yellows, greens and white. 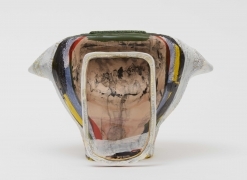 Working at a scale that allows for more space to wrestle with ideas of form, color, and line, the vessels in this series are less explicitly evocative of the human body than her earlier pieces and more formally concerned with the visual, physical, and psychological weight of color and the mass of line. 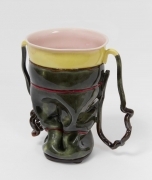 Yet Butterly’s wickedly irreverent wit and masterful sense of palette remain. 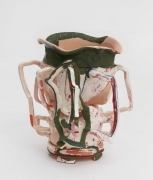 Seams of fleshy pink, pops of vermillion red, and strokes of dusty blue hug the crevices and curves of these crumpled vessels, affirming Butterly’s deserved reputation as a colorist par excellence. 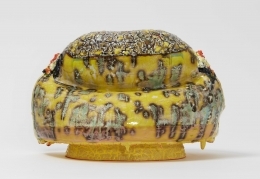 Surprising juxtapositions of texture, built—like her colors—through layers upon layers of glaze and repeated firings, simultaneously seduce and repulse. Thought Presence also includes fifteen of Butterly’s works on paper. 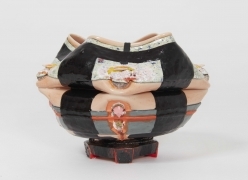 These multimedia collages begin with catalogue pages of her existing ceramic works, upon which Butterly pours and swirls richly-colored nail polish, often embedding beads and cut-out elements of other works into the varnish. 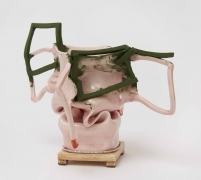 The creation of these pieces is analogous in many ways to her process with clay and represents a closed circuit of artistic reference. 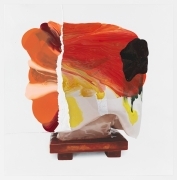 Butterly manipulates a readymade form and then builds meaning and density with color and line. She prizes nail polish as a material for its glaze-like properties, allowing her to play with relationships between colors and finishes. 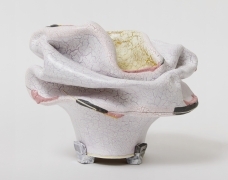 The beads in her collages echo the delicate porcelain trim that draws the eye around many of her works in three-dimensions. 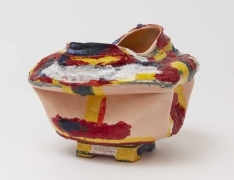 Unlike the ceramic works, which she develops over months of deliberation and repeated firings, the nail polish collages are executed quickly and completed in only a few days. 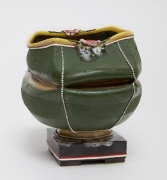 Their satisfying immediacy provides Butterly with a counterbalance to the laborious creation of her ceramics. 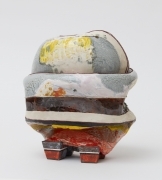 Kathy Butterly (b. 1963, Amityville, NY) has exhibited widely in the United States and internationally. 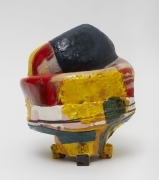 Her works are in the permanent collections of the Museum of Modern Art, New York, NY; The Detroit Institute of Arts, MI; the Museum of Fine Arts, Boston, MA; the Carnegie Museum of Art, Pittsburgh, PA; and the de Young Museum, San Francisco, CA among others. 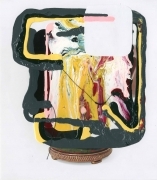 She has been the recipient of numerous awards and grants including a Louis Comfort Tiffany Foundation Grant (2017), a Guggenheim Fellowship Award (2014), a Smithsonian American Art Museum’s Contemporary Artist Award (2012), a Pollock-Krasner Foundation Grant (2011), and a Joan Mitchell Foundation Grant (2009). 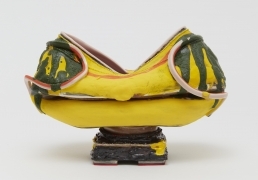 Butterly received her BFA at Moore College of Art before earning an MFA at University of California, Davis, where she studied with Robert Arneson. She lives and works in New York, NY.